Your central thermostat is the control panel for your heating and cooling system. 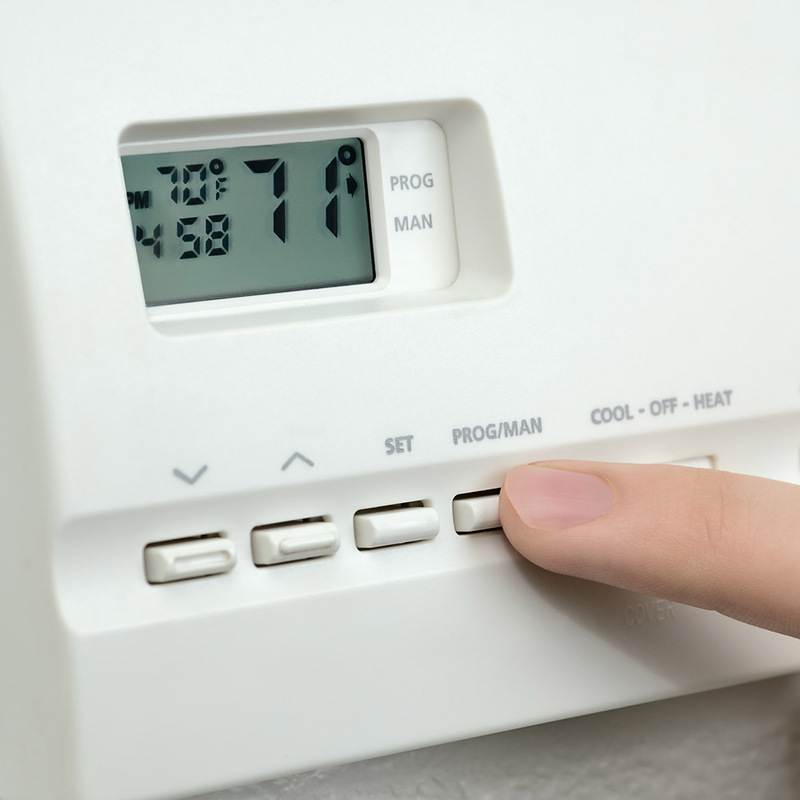 Although small and often overlooked, having the right thermostat greatly affects the efficiency of your air conditioning and heater. Before purchasing a new heat and A/C thermostat for your home, it’s important to know what kind of thermostat is right for you. Most people grew up using traditional thermostats to control the temperature of their homes. These are basic thermostats which you simply set a desired room temperature and the thermostat works to maintain that temperature within your home. These are available in either standard analog displays or a digital format. If you want to be able to set your thermostat to change temperatures throughout the day and week without manually doing it yourself, you will need a programmable or smart thermostat. 7-day – allows you to program a different temperature schedule for each day of the week (better for erratic schedules). 5-2 – allows for one schedule during the weekdays and another for the weekend. 5-1-1 – allows for one temperature schedule for the weekdays and a different schedule for Saturday and Sunday. 1-week – the least flexible option, but also the cheapest – allows for one temperature schedule for the entire 7-day week. Smart thermostats, like Nest, Honeywell, and Ecobee3, provide additional features such as WiFi, allowing you to control home temperatures while on the go. Most smart thermostats also take advantage of machine learning to self-monitor and adjust temperature and humidity for maximum savings. And some will automatically detect when nobody is home and switch over to energy-saving mode. 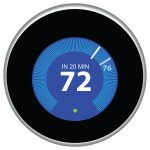 Analog, programmable, or smart thermostats? This is a homeowner preference. If you want to save energy on your utility bills, you can use programmable/smart thermostats turn your thermostat down when you are away from home to save on your heating and cooling bill. The challenge is to make sure to program your thermostat for maximum savings and efficiency. Visit energystar.gov for more tips on setting your thermostat. If you don’t have a programmable or smart thermostat, call the experts at Acree Air Conditioning to walk you through your options. There are many options to choose from, but any smart or programmable thermostat will save you money on your HVAC bills. Try out the ENERGY STAR® programmable thermostat tool and learn more about programmable thermostats (including some of their limitations) on energy.gov. Easy to Use – Once you set your thermostat, you don’t have to pay it any further attention. Classic Design – Traditional design allows your thermostat to blend in with any decorating. Consistent Comfort – Once you’ve set your desired temperature, there’s no need to adjust or reset the thermostat. You can save around 7% off your AC bill for every degree above 78 you set the thermostat. Just make sure that your thermostat isn’t near any heat sources, such as sunlight, lamps, and appliances. Unlike traditional thermostats, which are set to just one temperature, programmable thermostats adjust the temperature in your home based on time or day. Cost Effective – Since you can program your thermostat to change temperatures when you’re not home or asleep, this option allows you to save on your monthly bill. Simple to Use – Although more complicated than a traditional thermostat, programmable thermostats come with clear and easy-to-use menu options. Customizable – With seven different temperature options, you can customize your programmable thermostat to fit your lifestyle. Energy Efficient – Since you’re not running your heating or cooling system as much when you’re not home, you’ll use less energy, making this thermostat good for your budget and the environment. For more information on programmable and traditional thermostats and thermostat installation, give us a call at 1-800-937-6736 or set up an appointment with us online.